"I don't think I can do that, I've never taken a drawing class!" And I am the one who gets frustrated because coloring has very little to do with drawing. When someone says this, they are setting themselves up with a negative- I think I can't do it, therefore I can't. 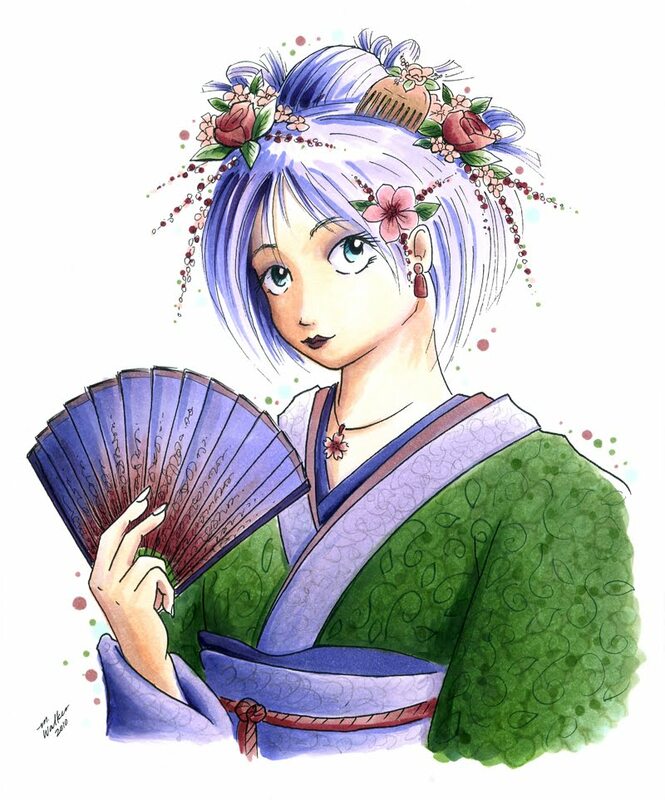 If Copic/I began teaching basic DRAWING classes for adults, would you be interested? Why? Has it been your lifetime dream? Have you discovered crafting in the last few years and now you are craving the chance to draw? Did you take a few classes years ago in college and now you want to learn again? Tell me about it! Let me know your creative dreams and ambitions! Let me know if you'd want to see workshops, retreats, online classes, or any other idea you have. Let me know if you are plenty happy with what you currently do and are scared of the idea of drawing your own picture. Let me know if you are scared stiff of drawing. No holding back here, people! Now, may you all have a great weekend, and the confidence to go out and do something creative out of your comfort zone!! Now is the time to plan your Summer events. 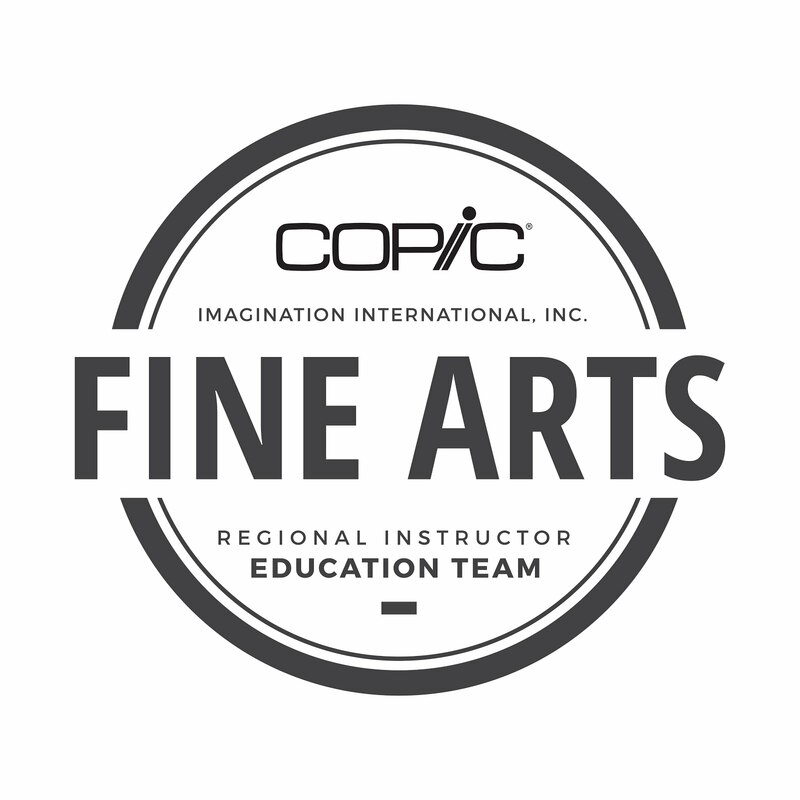 All the Copic instructors are busy planning for some great classes, and you can make your vacation this year a Copic Vacation. Beyond the Mixed-Media Copic Ink & Art event, and the Stamping Retreat in June, there are lots of other great Copic experiences coming this Summer to a city near you. Our Spring classes are filling fast, so register early to make sure you have a space. Classes open to registration two months before they take place. Check our website for more information and class details. A few dates have changed, so look over this list carefully. May 22, San Diego, CA taught by Jennie Black Open to stores and Designers- filling fast! 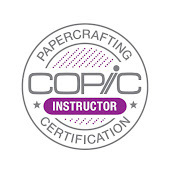 Intermediate Papercrafting Certification classes are popular! These classes are open to ANYONE who has taken the standard Certification class, and who wants to learn how to color and design more like an artist. There are still a few spaces left in the Phoenix Intermediate class, so if you are interested in attending send in your application right away! April 11th, Phoenix, AZ taught by Debbie & Colleen Filling fast!! 12th September in Hagen (by Diny Sprakel and Annie Fransen) = 1 day after Stempelmekka in Hagen. To register for Australian classes, see the Australian Copic website. If you are looking for a way to help the Japanese cleanup efforts and get the affected people the supplies they need, then we have a great fundraiser opportunity. I met last week with the owners of Stuff2Color, a website devoted to selling large, blank posters to color. One of their talented artists has created this beautiful Japanese tribute image, available for $10. This 10 x 14 poster is black & white, and just begging to be colored with Copics. All proceeds will go to the Japanese Red Cross. We look forward to helping the Japanese people rebuild their lives and know that their friends from around the world support them. Whew! I had over 430 people leave comments on my blog for a chance to win a copy of my new book, Shadows and Shading. I have been waiting for this to come out and still waiting for my local store to get it in...I sure would love the chance to win. Thanks for coming out with this amazing book! Congratulations Eva! 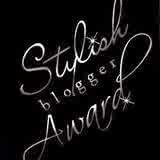 And congratulations to all the other winners on the other blogs. I know that you will enjoy those books. This Friday, April 1, from 5:30 to 8:30 I will be once again signing books down at DIVA gallery, 280 W. Broadway, Eugene. I will also be demoing how to use Copic markers, so join us for a fun evening. My artwork is on display through the end of April. Hopefully, this Friday will be a little drier than the last event! 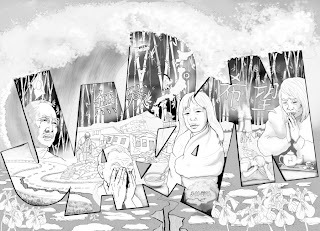 You can buy copies of my book, Ken's books, and prints of some of my artwork. I look forward to seeing you there! Colleen Schaan and Bianca Mandity are hosting an amazing mixed-media workshop the first weekend in June in Indianapolis. Applications have not gone out yet, as we are still finalizing class details, but the class will be open to anyone. 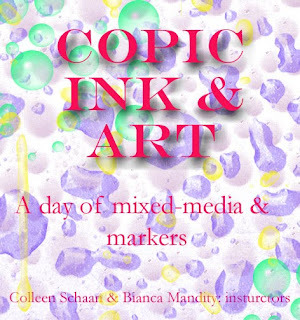 This will be an all-day class, specifically for people who want to experiment with Copic markers and make some wonderful, serendipitous creations. June 18th I will be teaching a certification in Coos Bay, OR on the beautiful Oregon Coast. If you have never taken a certification, or have never visited the Oregon Coast, then this is the class for you! After the certification, you can register for an evening card-making class with Our Craft Lounge. We'll have lots of fun, all weekend, so if you are interested be sure to sign up as soon as that class opens next month and ask nancy@copicmarker.com for more details or to get an application. So, if you are looking for a great vacation in June, then be sure to include Copic in your plans! Note: Commenting is now closed. Winner will be posted Monday. Thanks for commenting!! The Shadows & Shading book is now available at many of your favorite retailers (sorry, we do not sell direct or else I could post a link), and so we wanted to offer a chance to WIN a copy for yourself. Thursday the Copic Instructors in the US and Australia are doing a Blog Hop!!! 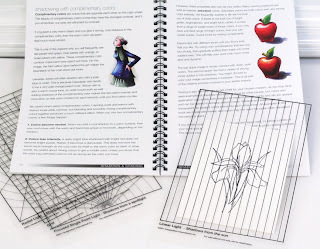 My new book, Shadows and Shading is great for beginners, either papercrafters or artists - this is the reference book you have been looking for to help you add shadows to give your projects more dimension. 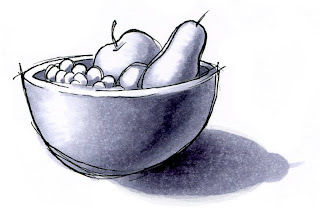 The book does not teach you to draw, rather to help you add shadow and shading. 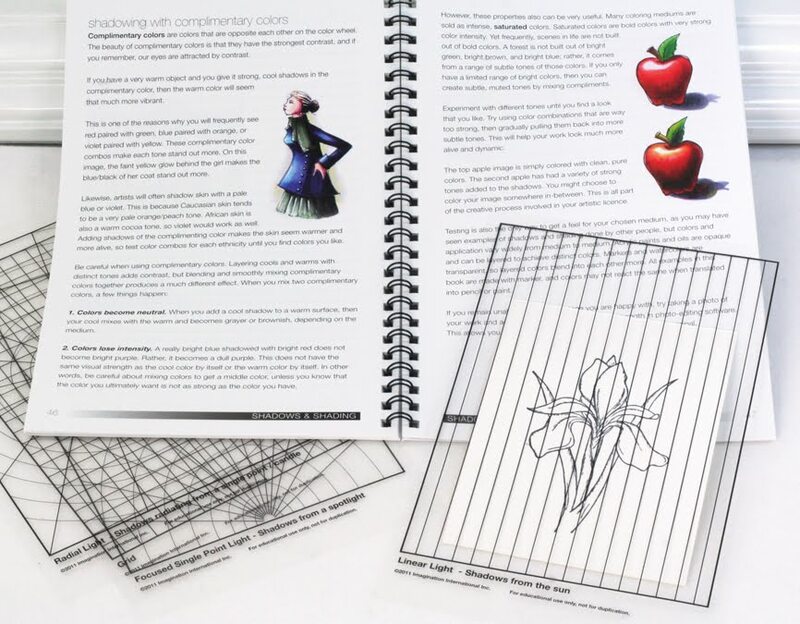 This is a wire-bound book that comes with 4 clear printed guides to help you add shadows properly on your own work. So far, the people who have read it love it! There's a lot to digest, so take it slow and read it often to let the concepts sink in. Now, a Blog Hop wouldn't be as much fun without BLOG CANDY!!! Today or Tomorrow each of the blogs listed below will be posting an opportunity to win. One lucky commenter per blog, so you have lots of chances to win. That's right, simply leave a comment on this post and you'll be in with a chance to WIN this fabulous book!! You have until Sunday to leave a comment on my blog or any of the following blogs. Here's the list of blogs you can comment on for your chance to win. Please note, this contest is only open to North American Residents on the North American blogs, and Australian Residents on the Australian blogs. I don't know if I've shown this picture before on this blog, but it really does a nice job of showing a cast shadow. Cast shadows can be scary! You have to draw in a shape that isn't there. Aaack! However, it is worth it. 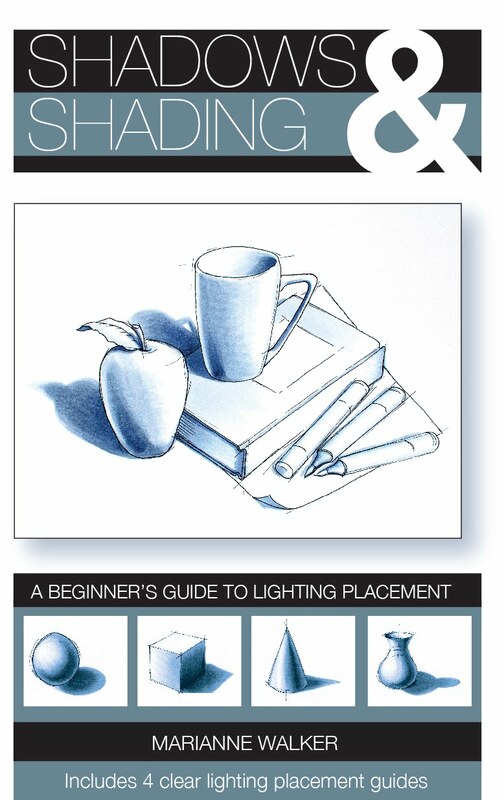 Practice makes perfect, and the clear lighting placement guides included in the book are perfect for practicing without wasting paper. Look at the first picture, without a cast-shadow shadow. 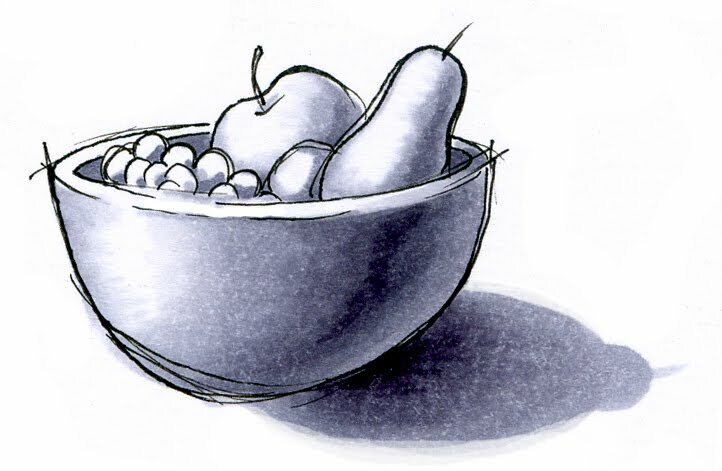 While the object is beautifully rendered, it has no "place". It is a floating object without reference. This looks strange, because it is easy to see the dimensionality of the guitar and where the light is hitting it. The easiest way to "ground" our image is to add a cast shadow. The shape of the shadow mimics the shape of the guitar. 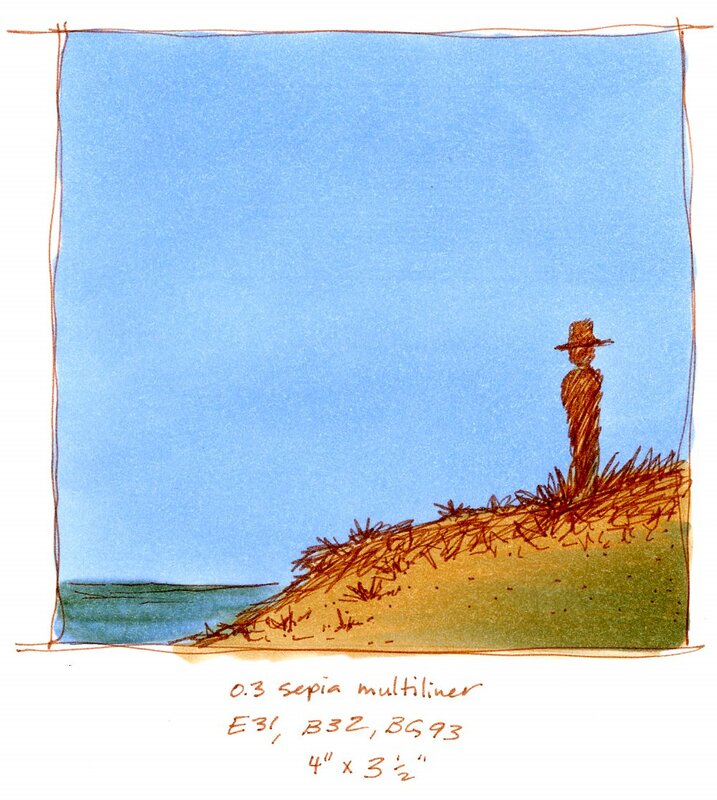 On this image, it is almost parallel. If you are worried you're not doing it right, you can take a second copy of the image, slide it over a bit, and trace it. On this example you'll notice that my shadow is purple, not just gray. The shadow gets more gray as it gets farther from the eye. The shadow gets lighter under the neck because there is more ambient light. 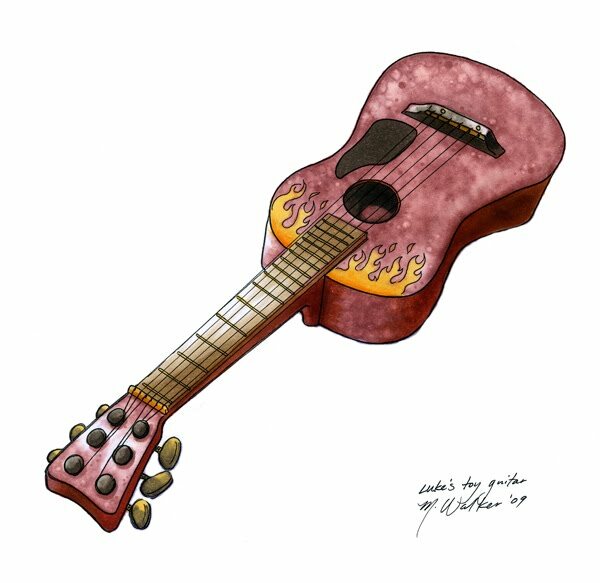 Notice the neck and the top area with the tuning pegs. These are not colored a flat color, even though the light would hit those surfaces uniformly. By giving them slight color variation (lighter in the middle) it helps to add to the shine/dimensionality. 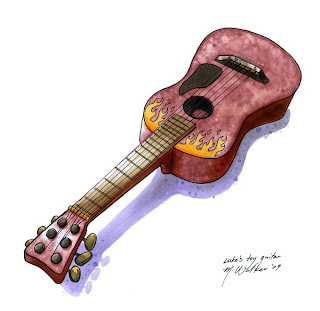 The texture on the main body of the guitar was made with a colorless blender. This created the splotchy blended/washed out look you see. I hope that you can come to see how much more life a shadow gives, have a wonderful creative journey, and good luck with the contest! I wanted to do a quick tutorial on the Anime girl I posted a couple days ago. It's the little details that make the whole look so nice, and the details are easier than you think! Don't get overwhelmed, just try one or two of these simple ideas in your next project, and I bet you'll like the results. Face: The face is made of a good range of skin tones, for strong contrast. The detail here that I want you to notice, especially above the eyes, is that I used the same pale BV from the hair for the BV in her skin shadows. This makes her facial tones match better. I also kept some shadows crisp, while I blended out the smooth areas as much as possible. I made sure that I shaded under the strands of hair in her bangs as well. Notice that I added a very faint gray/purple shadow on the edges of her eyeball. this gives it a little dimension, yet makes the white area still stand out. Clothing: (Jing, this one's for you). Jing saw this picture in my portfolio at CHA and was impressed with the clothing. I explained how to do it and she was surprised at how simple the technique was. So I promised I would share it someday on my blog. 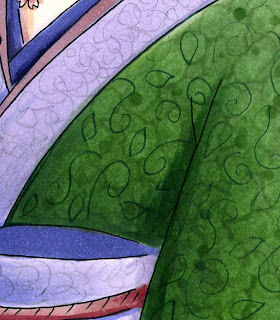 The rich green in her kimono is a couple shades of green, smoothly blended together. Then, while the background was still wet, I dabbed in some colorless blender. I also added a few dots of the darkest green to finish the texture. This created the subtle variation you see. Once it was dry, I took an olive 0.05 Multiliner and doddled in the darker swirls and leaves. The final effect, when viewed from a distance, looks like a very elegant pattern. The purple fabric was much simpler. I blended the purple together, then to finish it off, I scribbled with a regular pencil the pale gray pattern. That's it. 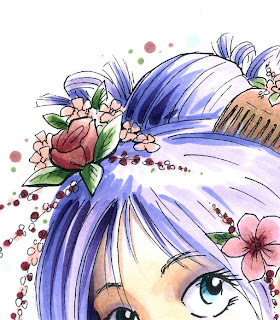 Because the pencil was so light, it kept the tones of the purple underneath and looks very nice. Hair: I did not blend the hair at all. Rather, I colored it in simple streaks- I left the highlights white, then added BV00, BV04, and BV08. That's it. From a distance it looks much more complex. I just made sure that the streaks overlapped in a way that you can still see the individual strands from each layer. I made sure to darken the shadow side more than the highlight side, and deepen the area behind her head the most. Even the flowers and blossoms are colored very simply. However, the detail in the drawing itself makes it look much more complex. I repeated the pattern of the blossoms in the sky around her head simply by dotting with the same light green and light pink. I dunno why, but for the last couple years I have enjoyed doing this, and I like the look it produces. Call it a personal quirk. Also, I was presented to the Stylish Blogger Award by Robin. Thank you Robin!! I am happy to inspire you. I don't really do the questions about myself, since those of you who are my friends on Facebook see enough of my personal life. I also must confess that I don't have time to follow blogs much. I've found that I have time to either be a media producer or media consumer, but not both. 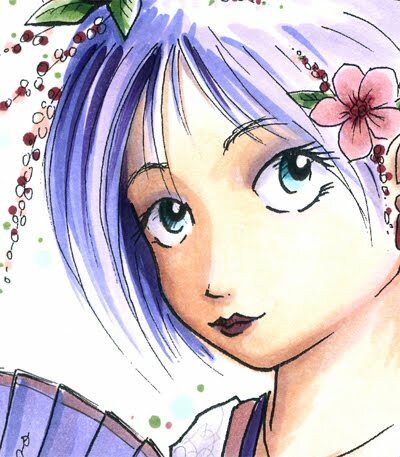 However, I regularly go to the Copic Blog because there is such a variety of artists featured on there that I am always able to find inspiration...check it out! Our hearts have been in Japan this past week, as thousands have become homeless in Northern Japan, following the earthquake and resulting Tsunami and the potential problems from the nuclear power plants that have been damaged. 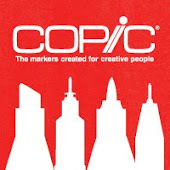 We have had word from .Too Corporation (the Copic Manufacturer), which is located south, in Tokyo. Everyone is safe. The first night after the quake, the train service was disrupted so some people had to sleep in their offices because they could not get home. However, things are slowly returning back to normal, and so far the e-mails have been positive. We are grateful for everyone's concern, and we will keep you updated. Please continue to support those people whose lives have been uprooted from this disaster. Every now and then I doodle at work to keep my portfolios fresh. 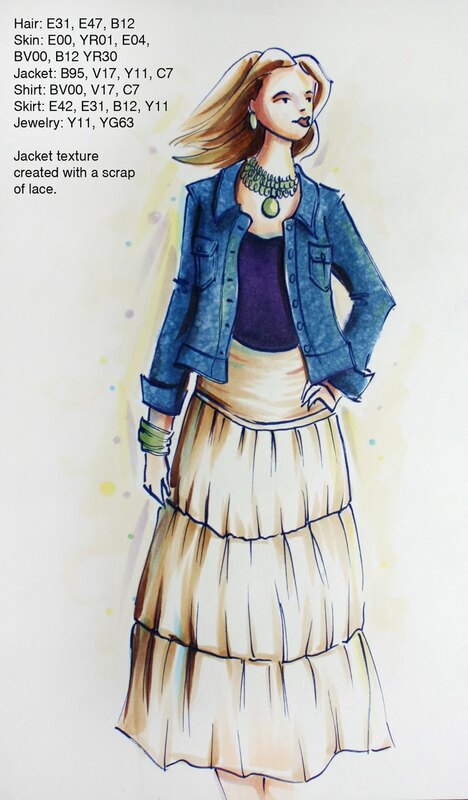 Here is a quick sketch I made this morning to freshen up my fashion design sketches. I drew it with a Cobalt multiliner onto color laser copier paper. When coloring, I did not use any kind of blending groups, as I just randomly grabbed colors from my desk. You'll note that I used some colors in my shadows that had nothing to do with the main tones, like V17 as a shadow in many areas, as well as BV00. I added yellows, purples, and faint blues to the sky behind the drawing just to liven up the illustration a bit. The nice thing about doodles I do like this, is that they end up sitting on my desk for a week, where, I will frequently look at it and make a minor adjustment or tweak. In a week this picture will look much more refined and detailed. Our Spring classes are filling fast, so register early to make sure you have a space. Classes open to registration two months before they take place. Check our website for more information and class details. I have been keeping this blog for a few years now, and I know some of you have not had a chance to dig through my old posts. Someone today had a question about techniques for smoothly coloring large areas, so I figured I would share this sequence of older posts again to help those of you who are struggling with this as well. Let me know if there are any of my old archived posts that you also think others would benefit from revisiting. I don't like repeating myself, but I also hate to think that people are missing juicy tidbits from the past. Some of you may have seen a great video of Colleen Schaan, our East Coast Regional Certification instructor being interviewed on the web TV show Inspirations by Julianna. If you missed the show, you can view it HERE on the Cool2Craft Chanel on YouTube. And guess who the authors are? Colleen Schaan and... Me!! I was so excited when Colleen asked me to help her with this project! People have needed a Copic coloring book for a long time now, and we finally listened. We've been working for months on this book, published by DRG / Annie's Attic. It won't be available for a few months, but you can make preorders now if you are a store. This book is for beginners who want step-by-step tutorials on how to start coloring and using Copic markers. Each step-by-step technique is shown with many beautiful card examples, made by a great group of very talented papercrafters. Pre-orders (for store owners/wholesale) available now through DRG Wholesale. The e-version downloads should be available from AnniesAttic.com about May 27, approximately four weeks prior to the on sale date for this book. The Shadows & Shading book is for teaching you where to place highlights and shadows when coloring with any medium, and is now available. 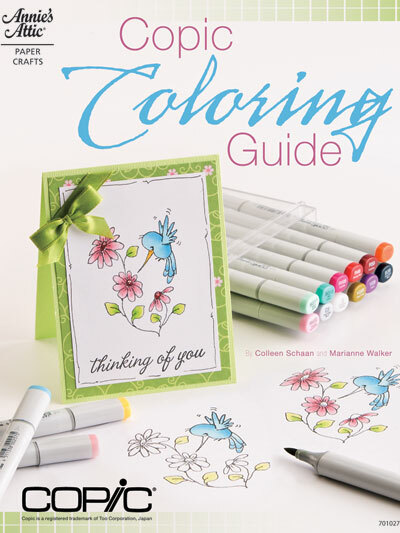 The Copic Coloring Guide book is to teach you how to blend and color with your Copic markers and make cute card projects, this is coming out in May/June. Tonite I will be at the book signing party for the Shadows and Shading book. Join us from about 5:30 to 8:30 to purchase autographed copies of the book and see some fabulous artwork and other books by Ken O'Connell (president of Imagination International). We will be at DIVA, 280 W. Broadway in Eugene, OR. Our gallery show will be up until April 29th. I hope to see you tonite! My new Shadows and Shading book is back from the printer and is now shipping!! You cannot buy it direct from us, but you can order it from your favorite local store or online. 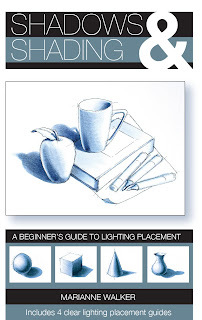 This book is devoted to beginners who want to learn how to put their shadows and highlights in correct places to make things look dimensional and believable. If you are local, be sure to stop by our book signing party on Friday, March 4th at DIVA art gallery (Broadway & Lincoln in Eugene) from about 6 to 8pm. You can purchase copies of the book from us there, and see some of my artwork on display. It should be a great party, so stop by and say hello and get an autographed book. Later this week I will have some more exciting news, and I hope to upload some photos from my demos this weekend on the Copic facebook page, so be prepared! Have a great week!